Assist NY is one of the most client friendly Translation companies in Syracuse NY. Our charges, when compared with other leading companies, stand as the best translation rate in this industry with our low cost 100+ Languages approach. We easily offer certified Translation services in Syracuse NY such as document translation, birth certificate translation, official translation, Legal translation and simultaneous translation in and around Syracuse, NY. We offer good quality translation at a very nominal price of $17.5 per page (of 250 words). Our other popular services are Audiovisual Translation, book translation, audio translation, business translation, video translation, voice over translation, voice translation, marriage certificate translation, website translation, subtitle translation and movie translation. 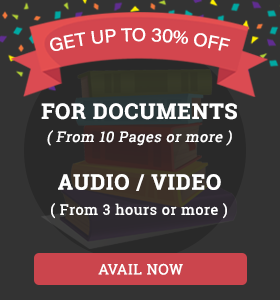 Just upload any type of audio/ video formats: AIFF, WAV, AVI, MPEG, Mp4, WMA, WMV, Mp3, AU, MOV, SWF and document file formats: Word, pdf, ppt and others.